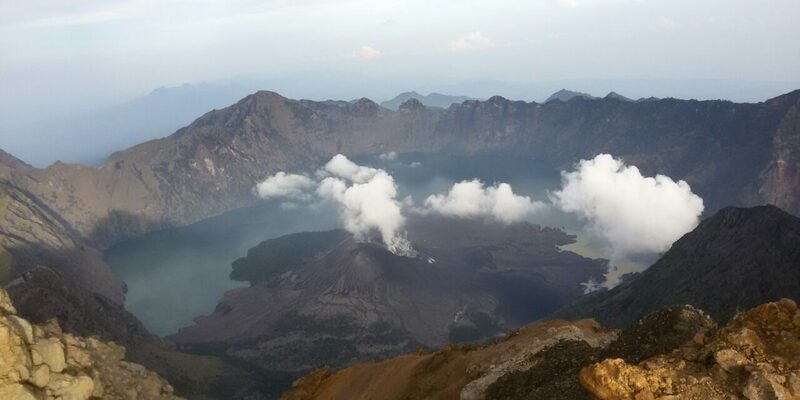 Hiking Mt Rinjani to Lake and summit 4 days 3 nights via Senaru village on 601m, to crater rim Senaru, lake, hot spring, crater rim Sembalun, summit and trek down to Sembalun village. Arrival Day : We will come to pick up you with air condition car at your arrival place or hotel within Lombok island then transfer to Senaru, meet with us and check in hotel provide in Senaru. If you have enough time we will guide you to walk waterfall and return to hotel..
Day 1: After an early breakfast at hotel we will walk and register at the Rinjani Trek Centre in Senaru (601 m) before commencing our trek. The trail initially passes through dense tropical forest. We stop at Pos 1 and Pos 2, pausing for rest breaks and snacks. At Pos 3 (2,000 m) we stop for a longer break for lunch. After lunch we continue the trek to the crater rim. As we climb higher forest is replaced by grassland and the trail becomes increasingly steep. We camp the night at Senaru Crater Rim (2,641 m) with views of the sunset, Mount Agung in Bali and the Gili Islands, the summit of Mount Rinjani, Lake Segara Anak and Gunung Baru, the small volcanic cone within the crater. Day 2: After enjoying the sunrise and breakfast we commence our descent into the crater. The trail is steep and rocky and passes through thick forest. We stop for lunch on the shore of Lake Segara Anak (2,000 m) and set up camp. The afternoon can be spent swimming in the hot springs, fishing, exploring the lakeshore or simply relaxing. Day 3: After a leisurely morning we enjoy lunch on the lakeshore before commencing our climb out of the crater. The trail is steep and slippery in places. We camp the night at Sembalun Crater Rim (2,639 m) with amazing views of the sunset, Lake Segara Anak, the summit of Mount Rinjani and northern Lombok. Day 4: We wake at 3am for a light breakfast before commencing the challenging three hour trek to the summit (3,726 m). We arrive in time for sunrise, the best time to enjoy the spectacular views. Returning to our campsite on the crater rim we stop for a hot breakfast and a rest before commencing our descent to Sembalun. We pause for lunch at Pos 2 or 3 and arrive in Sembalun (1,156 m) in the early afternoon, from where you will be transported to your next destination.